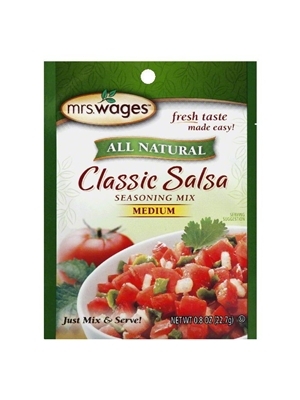 You can't go wrong with Mrs. Wages Classic Salsa Seasoning Mix Medium in this delightful classic tomato based salsa mix. The delicate balance of seasonings and vegetables compliments homegrown fresh tomatoes. A can of petite diced tomatoes, that you pick-up for last minute preparations, is also a quick alternative for this mix. .8oz. DEHYDRATED VEGETABLES (ONION, GREEN BELL PEPPER, JALAPENO PEPPER, CHILI PEPPER, GARLIC), SALT, SPICE, MALTODEXTRIN.